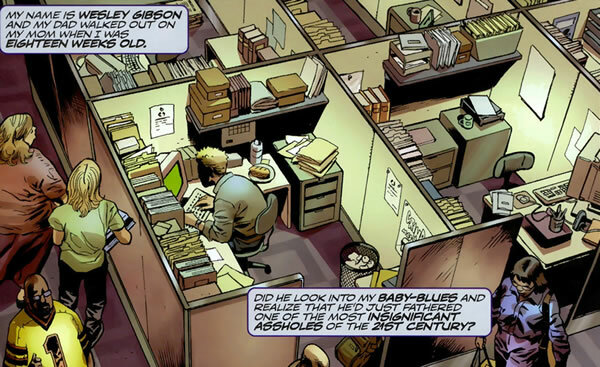 I very much have a love/hate relationship with Mark Millar as a writer. On one hand, he's written a bunch of books I've really liked over the years. On the other, his public persona is all the worst aspects of P.T. Barnum and Billy Mays mixed with a WWF wrestler from the 1980s. (If you think I'm kidding about this, you need only read one of the missives he puts down in the back of any single issue of his comics of the recent years, where he talks about how everything he has coming out is better than anything ever put out in the history of comics. Seriously.) Add in the fact that when he's off, he's really off, and you have a writer I feel like I need to consider quite carefully before I pick anything of his up. All that said, "Wanted" is one of my favorite books of the last decade. There was a movie made about it that was good, but veered so much from the source material as to be almost unrecognizable. The concept isn't all that complicated - it's a world without superheroes, and the supervillains have taken over, but they aren't all crazy and in the limelight. They've learned that the best way to rule is from the shadows, and while they get occasionally crazy, they also tend to keep a lot of it in check and under the covers. They're sort of like the Mafia and the CIA all rolled into one, but, y'know, with super powers. Wesley Gibson is the protagonist of the book, and also the narrator, although there are a lot of points where you feel like Wesley is doing an impersonation of the narrator of Chuck Pahalniuk's "Fight Club," all self-loathing and nihilism and despondency. Wesley, as it turns out, is also the son of the late great, Killer, one of the most powerful supervillains out there, who was recently assassinated. The Fraternity (which is what the organization of supervillains is called) want to recruit and train Wesley to take his father's place, and to help them find out who killed their father. In a lot of ways, Wanted is a classic hero's journey told from the flip side. Instead of teaching Wesley how to be good and noble, they teach him how to be evil and self-serving, how to not only endure violence but how to revel in it. And, like the classic hero's journey, they teach him how to fight, which comes pretty naturally to him. As you read Wanted, you're probably going to feel pretty conflicted about how you feel about it, which is good. Wesley turns from walked-all-over to one-doing-the-walking relatively quickly, and a reader with any moral compass at all will say he's overcompensating and going too far in the other direction, which is of course the point. Wesley reaches the depths of humanity and keeps on digging, committing murder, theft and other horrible acts pretty mindlessly, without seeing it have really much of an impact on Wesley's psyche. It's the story of a supervillain told by a supervillain who doesn't have any regrets over what he's become, and has contempt for anyone who can't do what he does. The book's going to make you feel a little squeamish, and that's by design. Millar wants you to see what life would be like for a supervillain who got away with living that sort of life, and J.G. Jones turns in an absolutely amazing collection of art. Jones is mostly a cover artist these days, much to my sadness, because he knows how to fill up panels with all the details they need, and how to pull focus in dramatic angles and lightning like a good film director, and "Wanted" is him firing on all cylinders. At some point, I hope to track down one of his original pages from either "Wanted" or the "Marvel Boy" miniseries he did with Grant Morrison. The other great thing about "Wanted" is that it's a self-contained story - you don't need to get any other books, and I don't think we're likely to ever see a sequel, which is fine. This book tells you the entire story you need, and you don't need a page more. "Wanted" is sort of the end-of-the-line of the approach that "Watchmen" and "Dark Knight Returns" were putting forth in the 1980s - this is as dark and gritty as you'll ever need to get. But it's also a hell of a story. This one Millar hit out of the park. Just don't get me started on how much I hate "Superior."